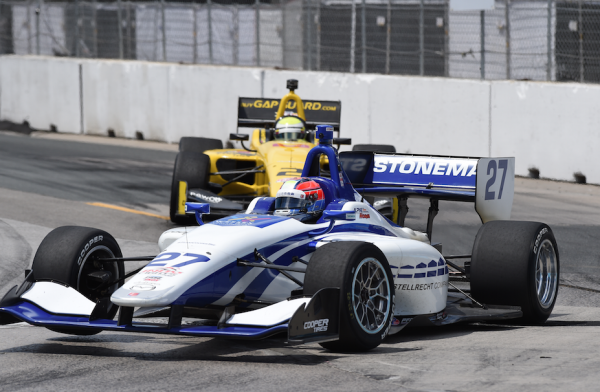 Indy Lights Presented by Cooper Tires, Toronto, Canada, 16th July 2016 Dean Stoneman reduced the gap at the top of the IndyCar feeder series championship after a gritty driving display to finish 5th despite driving over half the race with a damaged rear suspension. Stoneman, racing for the first time on the streets of Toronto had suffered a frustrating qualifying session earlier in the day and was unable to get his Strellrecht Mazda any higher than 11th place. For the race, Stoneman was eager to move through the field from the start and he did just that moving up to P9 after the first lap. The 25 year old was looking strong and began to push the car in front to gain even more positions on the bumpy Canadian street circuit. It was however to be from behind where Stoneman’s race was so very nearly ended when on lap 9 an irrational dive down the inside at the end of the long fast straight by Piedrahita caused a huge collision to the rear of the Andretti driver’s car. Stoneman was unharmed, but his car suffered a severely bent rear wishbone. The resulting crash moved the British Rookie up to 7th place as a nervous team looked on for a possible puncture. As the race unfolded, the Southampton based driver showed real class to pick off even more place as he dived down the inside of championship rival Jones whilst nursing the suspension damge. In the closing stages Stoneman was to make up one further place to 5th following an accident, but it was more than Stoneman deserved after he brought his car home despite his damaged suspension. Stoneman will now turn his attention to race 2 from Toronto tomorrow.